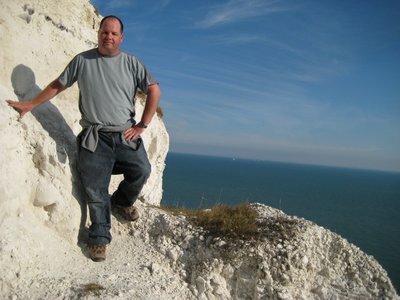 Scrambling over the physical and emotional geography of Dover’s famous chalk cliff faces. Continued from White Cliffs Part I: A Kite On The Breeze. After leaving St. Margaret's Bay, I headed back up past the South Foreland Lighthouse. I passed the spot where the girl had been flying the kite, but as I expected she and her friend were gone, and I felt a tinge of regret for not going up and saying hello to her when I had the chance. Another lost opportunity. 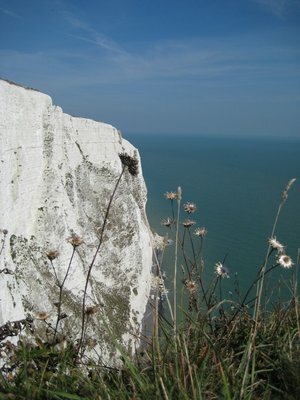 Instead of heading back towards the White Cliffs Visitor Information Centre via the direct inland route, I kept close to the cliff edge, following a ridge that started heading down along the cliff face. The ridge was wide and flat, with the remnants of a fence on the edge of the cliff and machine chiselling on the cliff face rising up above us, leading me to think that it used to be a road. If it was a road, they had wisely converted it to a path, providing me with a leisurely stroll in the dying fall light with the sea breeze cooling me off. The path along the ridge went from wide and flat to undulating and overgrown so gradually that at first I didn’t notice. There had been a couple paths branching off and up the cliff face, but I had always elected to stay on the ridge. As I continued down the ridge towards the shore, the cliff face above me grew higher and higher, providing no more opportunities to cut up to the top of the cliff, and of course that’s when the path in front of me started to disappear. At first, it just became more overgrown with grasses, but then the grasses were replaced by stands of trees. The path wound its way through the trees, and I found myself ducking underneath branches and trying to slide nimbly past encroaching thorn bushes. Those that know me well know that I am not good and sliding nimbly past anything. Barging clumsily I can do well, sliding nimbly is outside of my repertoire. I tried to gingerly make way through the thorny, dark path, but the bushes were soon clawing at my hands and arms, leaving them scratched. Sweat started to pour down my arms, getting into the freshly opened wounds and stinging. I ducked under one low tree branch, only to come up and hit the back of my head on another branch directly behind it. While I was cursing the growing number of scratches on my arms from thorn bushes and rubbing my head after crashing into the low branch, I wasn’t too concerned about where the path was heading. After all, I have many times found myself off the beaten path, literally, and have most often found myself stumbling, dazed, sweaty and covered in scratches out onto the main path, scaring passerbys who think I am some sort of wild-man. I assumed this time would be similar. 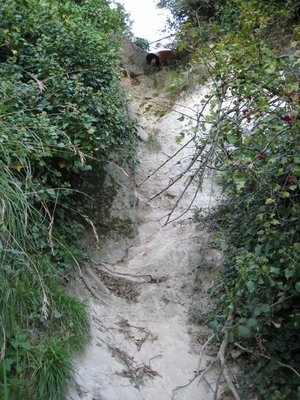 The path ended against a steep wall of dirt. Looking up, I could see a small fence, indicating to me that a walking path was above me. I surveyed the situation. The hill was steep, looking near vertical for the last 10 feet for so. The vegetation to the side of the dirt was all thorn bushes, meaning that I couldn’t rely on that to grab onto and pull myself up. Finally, there was a large, rusty sewer pipe sticking out at the top, meaning that the last thrust would require me to pull myself away from the face of the hill and up and over that obstacle. A smart man would have turned around a backtracked. In fact, for a second my brain turned on and convinced me to turn around and walk back to the last fork in the path, some 15 minutes back. Then, perhaps due to lack of hydration or still smarting from hitting my head on the tree, my brain turned back off again, save for the synapses responsible for stubbornness. “There is no way I am turning around and walking back. This was a perfect valid path to follow, and this is just a small hill to climb. Are you man, or are you mouse?” the little devil on my shoulder said. “Man!” I replied, and started climbing. Sadly, neither man nor mouse was what I needed to be. Really, mountain goat probably would have been the best choice, or perhaps something that could fly. The first half of the hill was fine. I easily found toe and hand holds and pushed myself up the steep hill. Then, on the second half, the hill turned into a vertical cliff, and the dirt became a slick track of shiny, dusty rock, hard to grip. Along the left side there was a partially crumbled concrete pillar sticking out from the face of the cliff, which provided me with hand holds that I could use while my feet found purchase. I reached the bottom of the sewer pipe, and blindly reached over with my right hand, patting the ground above me. My hand landed on a root sticking out of the ground. I grabbed it and pulled. It held. I perched my left foot against the concrete pillar beside me, with my right perched with just the toes on a small rock jutting out from the hill. By simultaneously extending my legs to push me up and pulling my my right hand, I was able to get my head and torso up over the sewer pipe. I surveyed the ground in front of me. Other than the root already in my right hand, there was nothing to grab on to until the chain link fence at the border of the path. I stretched out my arm, but my fingers were just short of the fence. I stood on my toes, giving myself another few inches, and my fingers just brushed the metal of the fence. Letting myself slide down a touch to get some more power from my legs, I thrust myself forward, my feet lifting off their holds as my left hand grabbed the fence securely. I pulled myself up and over the sewer pipe on arm strength alone, my feet dangling uselessly beneath me. Leaning against the fence, I caught my breath, and then hopped over, landing just in front of a female passerby who appeared startled to see a dazed, sweaty and covered in scratches wild-man coming out of the bushes. She looked at me warily, and I thought for a moment she was going to raise her hiking pole and bash me with it. “Um, I took the wrong path,” I said, by way of both an explanation and an apology. Seeing that I was nothing more than a doughy Canadian and not some half-man, half-wolf crazy, she relaxed. “Yes, they really sure label the paths more diligently,” she said, and went on her way, leaving me to try and shake the dust and chalk off my jeans. That evening I went out to explore Dover’s nightlife. There wasn’t much to explore. Early evening, the biggest crowd was at The Eight Bells, a Wetherspoons’ pub. For those that aren’t familiar with the pub landscape of England, Wetherspoons runs a number of pubs that are best known for cheap food and predictable atmosphere. The Eight Bells looked much like every other Wetherspoons I had been into, and had the same menu as them all. I got a steak with potato and salad and got a perfectly serviceable if somewhat forgettable meal. I walked down the pedestrian high street of Dover, but it was still only nine o’clock on not too many people were out. I ended up heading into a place called the Funky Monkey, which turns out was another chain. It was empty when I arrived, but soon started filling up with college aged kids. Everyone was pretty and young and dressed up. The girls all had on short, tight fitting skirts and the boys all had on their cleanest jeans and funkiest collared shirts. Everyone’s hair was perfect. The music was loud and the dance floor was soon full, but I am old (probably a good 10 to 15 years older than anyone in the bar) and was tired so after a few more pints retired back to the Penny Farthing Guest House for my comfy bed. The next morning was another sunny day and after settling up my bill with the Penny Farthing, I was off. My plan was to go and see Dover Castle, but then logistics got in the way. I had to check out of my hotel by 10 o’clock, and with no left luggage at the B&B, I was forced to take my bag with me. Arriving at the train station, I checked the schedule and saw that the trains left every hour at 32 minutes past. That done, I went to find lockers. There were none, nor a left luggage office. The bored looking ticket agent shook his head. “Nope. No place to leave luggage anywhere in this town,” he replied, rather ominously. I didn’t believe him though. How can a town which is a gateway, a place where trains, buses and ferries all converge, not have any place for those passing through to leave their luggage for a few hours? I tried the bus station first, which turned out to not even be a building but rather just a certain place on the road where buses pick up passengers marked by a sign. Usually I have seen those things called “bus stops,” but I guess even bus stops can aim for something bigger. Anyway, no building meant no lockers. Next I tried to leave it with the concierge at the Best Western Hotel. Hotels usually allow you to leave luggage. I’ve done it tons of times. Of course, usually I was staying at the hotel, but I figured they probably wouldn’t ask. “Are you staying with us, sir?” the girl at the reception desk asked. “You could try the train station,” she said cheerfully. Fat chance, that. Finally I made my way to the Tourist Information Centre. “No, I’m afraid we don’t have any place to leave luggage. Kind of inconvenient, I’m afraid.” she replied. I stood silently for a moment. Partly it was because I was contemplating if the chamber of commerce’s local tourist office would know that having no left luggage facilities was inconvenient, they didn’t do something to rectify it. Mostly though, I was hoping she would offer to hold the bag for me. Ironically, I had almost came down with my backpack instead of my rollerbag, but decided at the last minute that the rollerbag would be much easier than the backpack. If I had the backpack, I probably would have walked up the hill with it strapped on tight. But the rollerbag was just too inconvenient to drag around for the rest of the day. So instead of heading up for the castle, I turned in the other direction and walked back to Dover Priory station, and caught the next train to London. I’m sure I’ll be back to Dover at some point. I do want to go to Calais, and given that I in a totally non-anoraky way like boats, would like to take the ferry over to France. I’ll make sure when I do that I have a plan for my luggage and I’ll spare a couple hours for the castle. I sat on the train in a seat facing backwards and watched the white cliffs recede into the distance. The defensive walls of the fortress that is the British isles, unconquered for a thousand years, and the symbol of coming home for the wary traveller, glowing in the midday sun. The train turned inland, and I lost sight of the cliffs. Don’t feel too bad though, I am still wiping away the chalk dust from my jeans.